It comes with a green bright and cheery hardcover and 175 black and white pages. 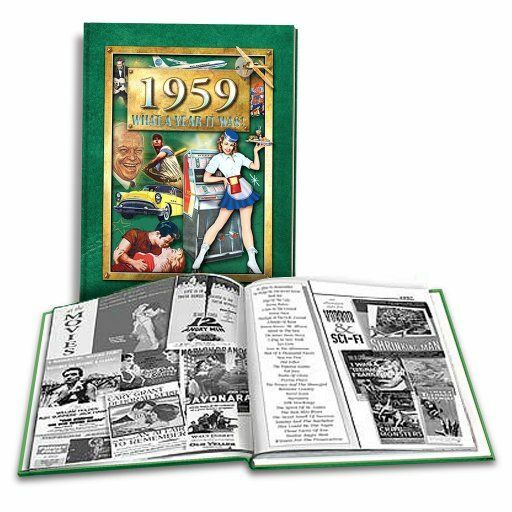 Inside you will find articles, photographs, the news, fashion, sports and entertainment all from the year 1959. These are only a few of the numerous nostalgic events. It�s something that will bring back all those sentimental memories! You are able to personalize this book with a 50 character message on a 2 1/2" diameter gold seal that will be placed on the front cover (see picture) for an additional $5.00. Personalization will NOT delay your order. THIS ITEM ON BACKORDER. See also our other 60th wedding anniversary gift ideas.